Here at Engadget, we don’t have the time to review every new laptop, but we wanted to make time for HP’s redesigned Spectre x360 convertible. After all, when the original came out a year and a half ago, we quickly named it one of our favorite Windows machines. So now that it’s finally gotten a full makeover, we need to see if the improvements are enough to help HP keep its spot on our short list. Like the original, this new model ($1,050-plus) has a 360-degree hinge, allowing you to use it in one of four modes, but whereas the original was designed with extensive input from Microsoft, it’s unclear how much of a say Microsoft had this time around. This time, too, the x360 is thinner and lighter, with a smaller footprint. It also brings a new dual fan setup for improved cooling and an upgraded webcam that supports Windows Hello facial recognition. These improvements are all welcome, and yet somehow this new version doesn’t feel as polished as its predecessor. The original x360’s relative heft was one of the few things I found fault with when I reviewed it. Fortunately, then, the refreshed version really is noticeably lighter. And smaller, too. First off, we’re down to 2.85 pounds — an 11 percent drop from 3.17 on the original. (The first-gen version weighed slightly more if you bought it with a full HD panel.) Meanwhile, HP reduced the thickness by 13 percent — it’s now 13.8mm, or 0.54 inches, as compared with 15.9mm (0.63 inches) on the original. For reference, the upgraded 15-inch x360, which we’re not reviewing today, now measures 15.9mm thin, making it as thin the earlier 13-inch model. As for that smaller footprint, HP pulled a page from Dell’s playbook and went with a nearly bezel-less display, allowing for a smaller chassis than you’d otherwise expect on a 13.3-inch machine. 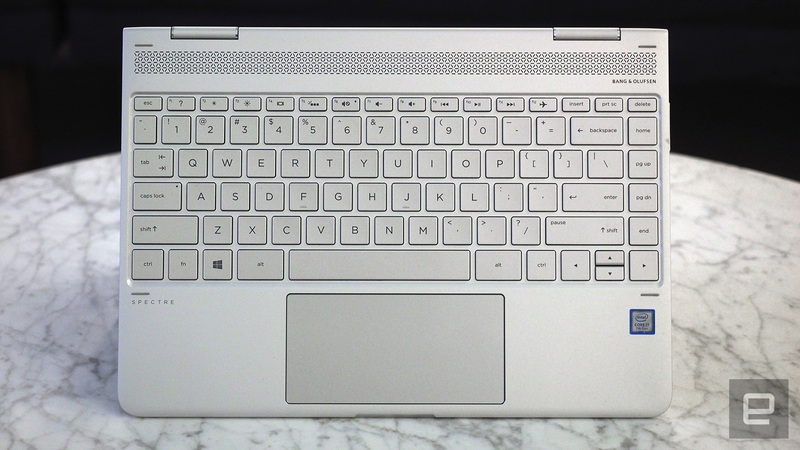 As a result of using this “Micro Edge” panel, as HP calls it, the design team had to retool the keyboard, extending it from edge to edge so as to take full advantage of the available space. It mostly works out — the backlit keys are well spaced and springy — and having just tested the Touch Bar MacBook Pros, I have a renewed appreciation for laptops with media shortcuts built into the Function row. That said, being a heavy user of the arrow keys, I never quite got used to the tiny “down” button. Also, because the left Ctrl and Function keys have each been shrunken down to the size of a thumbnail, I frequently hit Fn when I meant to strike Ctrl. Which happens a lot when you’re a fan of keyboard shortcuts. While I mostly enjoyed the keyboard, though, I was not impressed with the touchpad. Once again, HP went with a Synaptics clickpad — seriously, would it have killed HP to go with one of Microsoft’s own Precision touchpads? As spacious as the trackpad is, it’s also stubborn and unpredictable, with a high-friction surface that makes it harder to drag the cursor around than it should be. Also, it frequently rebels by registering phantom left clicks. This caused me to grab and reorder my pinned browser tabs when really I was trying to move the cursor around the desktop. I’ve noticed the same thing on other Windows laptops I’ve tested (many of which use Synaptics); it’s a telltale sign of a subpar trackpad. Throughout, the machine is made of solid aluminum, with the hinge made of stainless steel underneath. Though the silver color and unibody construction have carried over from the original, you’d never mistake this year’s for the 2015 edition. For starters, HP swapped in the same new logo it introduced earlier this year on its Spectre 13.3 ultraportable; you’ll see that on both the lid and the lower bezel. 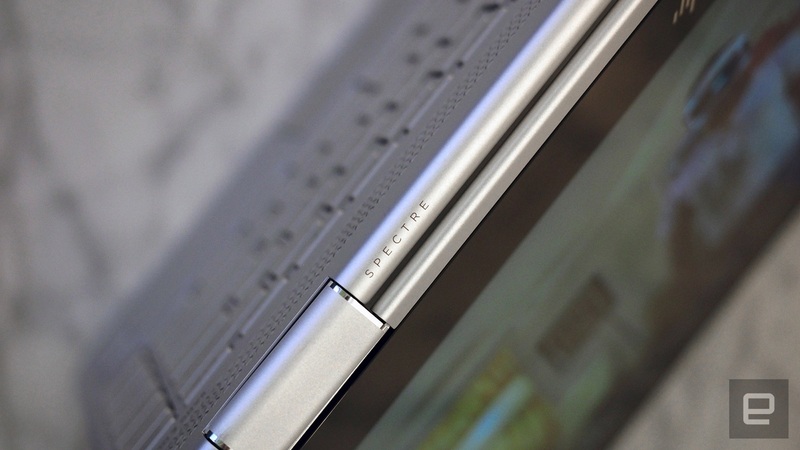 There’s also now a conspicuous Bang & Olufsen speaker grille stretching above the keyboard. In addition to the two speakers in there, there are two more on the bottom of the laptop, which means the total speaker count is double what it was last year. HP says the idea in separating the two speaker pairs the way it did was to ensure decent sound regardless of the usage mode. The speakers are certainly loud — when listening alone in my apartment, I opted to cap the volume at around 25, but probably could have gone even lower. But like so many other laptop speakers that came before it, these can sound a bit tinny, depending on your musical selections. Frank Zappa’s “Son of Mr. Green Genes” and Motown songs like Jimmy Ruffin’s “What Becomes of the Brokenhearted” seemed to be missing some crucial bass and drum notes. Beyoncé’s “Crazy in Love” sounded better, but then again, it’s a tinnier track to begin with. All told, the audio here is acceptable, but it’s nowhere near as good as on, say, the new MacBook Pro, which I happened to be testing at the same time as the x360. 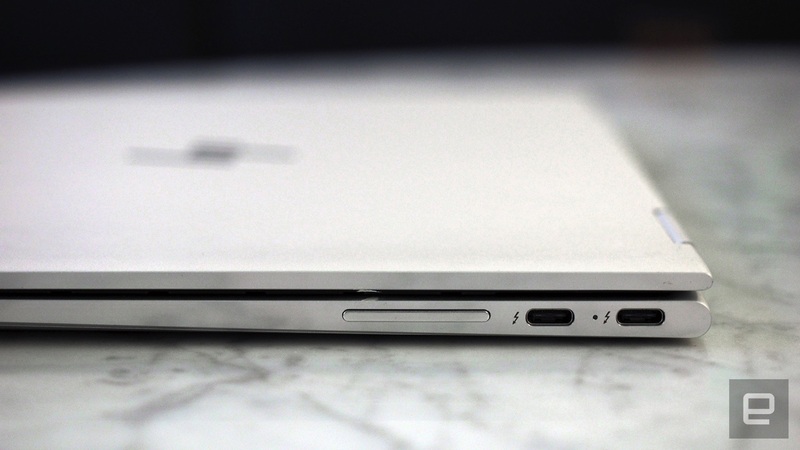 Also new this time: The addition of USB Type-C ports — two of them, to be exact. These ports also support Thunderbolt 3 accessories, and it’s also through one of these ports that you’ll charge the machine. Don’t worry, though: One of the original three full-size USB connections remains, meaning you won’t need a dongle to charge your phone or plug in any other peripherals you might have lying around. Unfortunately, however, while the full-size USB port and headphone jack both live to see another day, the rest of last year’s ports have all been sacrificed in the name of a slimmer design. That includes the full-size HDMI socket, the Mini DisplayPort and the full-size SD reader. This isn’t a surprise, especially considering what competing laptops have to offer, but it might still be a shame, depending on your needs. One thing that hasn’t changed much: the screen. We once again have a 13.3-inch, full HD panel with a 300-nit brightness rating and a color gamut that includes 72 percent of the sRGB space. The only difference this time is what isn’t offered: Whereas last time there was a step-up QHD screen option, this time it’s 1080p throughout, regardless of what the other specs are. An HP spokesperson declined to comment on whether the company might eventually bring back that sharper display option. While that might be a dealbreaker for people who were otherwise prepared to spend $1,500 or so on a high-end machine, the screen nonetheless offers satisfying viewing angles, with good contrast and color fidelity when you dip the screen forward. As I write this, I’m sitting on my couch in shorts, and the Spectre x360 is burning my thighs. I periodically have to shift the machine or even put it on a coffee table to give my legs a rest. The fans are whirring loudly enough for me to hear over my TV, though, so at least I know they’re working. So much for that improved cooling setup, I guess — all I’m doing is typing in Google Docs with a dozen open Chrome tabs. Spotify is open, but not streaming. None of this should be enough to send the machine into a tizzy. This seemed odd to me, and indeed, I brought in a second x360 for additional testing. That one didn’t get quite as hot, but it was still warm, even when all I was doing was working in a browser and Slack while streaming music. Even so, the intense heat I felt that one time is concerning. After all, that laptop was a production unit, coming off the same factory lines as any laptop you might buy. If it could happen to me, it could happen to you. The heat and fan noise are a shame, because as loud and hot as it is, it’s otherwise a strong performer. For starters, the x360 is, for now, one of the only laptops available with Intel’s seventh-generation Core processors, code-named “Kaby Lake.” It’s also available with up to 16GB of RAM on more expensive configurations, though PCIe solid-state drives are standard across the board. The model I tested had a 2.7GHz Core i7-7500U CPU, 16 gigs of memory, integrated Intel HD 620 graphics and 512GB of storage. In everyday use, the machine boots in a brisk seven seconds. Speaking of log-ins, the webcam here now has a 12 percent wider field of view and supports Windows Hello facial recognition. Setting this up was quick and easy, and the camera recognized me every time — so long as I wasn’t wearing glasses, anyway. To be fair, I had this same problem recently with Microsoft’s Surface Book, which also supports Windows Hello. Hopefully, future iterations of the technology will take into account that even regular contacts wearers wear spectacles sometimes. As for disk speeds, its NVMe-made PCIe solid-state drive achieved average max write speeds of 1.76 gigabytes per second, according to the ATTO benchmark. Its write rates weren’t nearly as fast, but still solid at 579 MB/s. HP rates the battery life at up to 15 hours and 15 minutes on the 13-inch model — up from 12.5 hours last year. (The 15-inch version we’re not reviewing today promises a max of 13 hours.) The company says that’s thanks to both more power-efficient processors and a larger 57.8Wh battery, up from 56Wh last year. Though I never hit that 15-hour mark, I did indeed get longer battery life than on last year’s model: 13 hours and 36 minutes in Engadget’s standard rundown test, which involves looping a video at fixed brightness. That’s hours longer than with some laptops this size, like the 13-inch Touch Bar MacBook Pro, and it’s about two hours longer than on last year’s x360. Obviously, your mileage will vary, but HP says the machine will recharge consistently fast regardless. In particular, the company claims that its “Fast Charge” tech can return the system to a 90 percent charge in 90 minutes. The new x360 starts at $1,150 and is available on HP’s website and at Best Buy here in the US. For that base price you get a seventh-gen Intel Core i5 processor, 8GB of RAM and a 256GB SSD. For $1,159 you get similar specs, except a Core i7 CPU instead of an i5. From there, you can step up to a $1,299 model that offers a Core i7 chip and doubles both the RAM and the storage (so: 16GB of memory with a 512GB SSD). The top-end model, which goes for $1,499, maxes out at 1TB of solid-state storage. Either way, as mentioned earlier, the screen resolution tops out at 1080p. The graphics are the same across the board too: Intel’s integrated HD 620 solution, though the i7 models have a higher Turbo Boost clock speed. There’s also Microsoft’s refreshed Surface Book, which also can be used in various modes. (It has a detachable screen, though, not a 360-degree hinge.) I reviewed it recently and was generally fond of it, my major complaint being that it’s relatively heavy, at 3.68 pounds. In exchange for that heft, at least, you get 16-hour battery life, fast performance and lots of ports. Think: two full-size USB 3.0 connections, a Mini DisplayPort, a headphone jack and a full-size SDXC reader. If you don’t actually need that convertible design, Dell’s XPS 13 ($800-plus) remains our favorite traditional laptop, even two years after it was released. Though it starts with just a Core i3 processor and 4GB of RAM, Dell uses seventh-gen Intel CPUs throughout, with options running as high as i7. You can also go up to 16GB of RAM and a 1TB SSD, with a 3,200 x 1,800 screen offered on higher-end models instead of a lower-res 1080p panel. Whichever configuration you choose, we’re fans of the nearly bezel-less screen, comfortable keyboard and compact design. I might normally have you look at Acer and VAIO too, but we weren’t thrilled with ASUS’s ultraportable ZenBook 3, and it seems VAIO hasn’t updated its 13-inch “Z Flip” to the latest Intel processors. That leaves Apple. Though the new 13-inch MacBook Pro doesn’t have a 360-degree hinge or even a touchscreen, for that matter, it’s similar to the Spectre x360 when it comes to weight, size, specs and starting price ($1,299 without the controversial Touch Bar). At 3.02 pounds, it’s in the same ballpark, but the battery life is shorter. Though both systems have comfortable keyboards, Apple wins as far as the touchpad is concerned. It also has a sharper display and clearer audio. But not so fast: HP keeps the convenient Function buttons, as well as a full-size USB 3.0 port. The refreshed x360 might not be as well rounded as its predecessor, but I suspect it still ticks off more boxes for more people than the MacBook Pro. That’s not to say there are no improvements — Windows Hello is a treat, as are the faster SSD speeds, longer battery life and wide viewing angles. But if our main complaint about last year’s model was that it was slightly heavy compared with the competition, it would seem that HP accepted some compromises in the name of shedding a few ounces. HP today launched its 27-inch ENVY display with 4K Ultra HD resolution and a built-in USB-C port for charging the new MacBook Pro, 12-inch MacBook, or most other USB-C devices at up to 60 watts over a single cable. The IPS LED-backlit display features a clean design with a micro-edge bezel, matte black rear panel, and a thin aluminum stand. The base can be detached for VESA wall or arm mounting, but a bracket is not included. The display has a 60Hz refresh rate and supports AMD FreeSync, designed to eliminate stuttering and tearing in games and videos by locking the refresh rate to the framerate of the graphics card. HP’s new ENVY 27 Display is available on HP.com and at select retailers in the United States for $499 starting today. The price point is about $200 cheaper than some competing USB-C displays, such as the LG 27UD88 and Lenovo ThinkVision X1, but features and connectivity vary. One display that may be a better buy in the near term is LG’s and Apple’s new UltraFine 4K display. While it has a smaller 21.5-inch screen, the UltraFine has true 4K resolution (4,096×2,304), built-in speakers, 3 additional USB-C ports, higher 500 cd/m2 brightness, and a wider DCI-P3 color gamut. LG’s UltraFine 4K display is $524—only $25 extra—until December 31. Afterwards, its price returns to $699.95, which will make it a less attractive option compared to HP’s ENVY 27 display, although still worth consideration. If rumors are true, Microsoft may be one of the few major consumer tech giants that doesn’t have a smart, voice-guided speaker in the works… but that doesn’t mean it’s sitting on its thumbs. In an expansion of recent code discoveries, Windows Central sources claim that Windows 10 is getting a Home Hub feature that will turn supporting PCs into rivals for the Amazon Echo and Google Home. You’d have a shared, login-free desktop that shares family resources like calendars and shopping lists, and a smart home app that would make it easy to control all your connected devices. And as you might surmise, the Cortana voice assistant would play a much, much more important role. Under Home Hub, Cortana would have access to both shared content as well as that of individual users who are signed in. That would tackle one of the biggest issues with devices like Google Home — that they’re frequently limited to supporting a single user’s account. Supporting PCs would also be much more Cortana-friendly. You could use voice commands from a greater distance, and wake up the PC with voice alone. Home Hub-ready systems could even tout light and motion sensors to wake up whenever someone enters the room. Provided the leak is accurate, it could be a while before you see every element of Home Hub. It’s reportedly scheduled to arrive through three significant Windows 10 updates (nicknamed Redstone 2, 3 and 4) that would start arriving in 2017. And if you want a PC designed for the feature from the ground up, you may have to wait until the very end of the year. Microsoft is said to be asking vendors (including HP and Lenovo) to step up with Home Hub-optimized all-in-one PCs in late 2017. There’s no certainty that everything will pan out as planned. WC is quick to warn that delays and cancellations could change features and timelines, assuming Home Hub ships at all. However, it’s easy to see the incentive for Microsoft to make this a reality. In some ways, Echo-like speakers reduce the need for a family computer — you can’t do your homework through a speaker, but you can accomplish tasks that would normally require breaking out your phone or sitting at a desk. Home Hub would keep the PC relevant for homes where a shared machine makes sense, and might even provide an edge over smart speakers by offering the visual, multi-user info that you don’t get right now. Managing editor Dana Wollman and senior editor Devindra Hardawar join host Terrence O’Brien to talk about the week’s biggest tech news, including Nike’s new self-lacing shoes, Netlix’s offline mode and “yelfies.” Then they’ll rant about what’s been bother them this week, whether that’s DirecTV, crappy touchpads or Amazon’s convoluted pile of apps. Lastly they’ll try to unravel the complicated mess that is Rule 41 and what it means for privacy in America. As before, the biggest hurdle is making it all practical. The non-volatile memory needed to make MDC shine isn’t due until sometime in 2018 or 2019, and HPE won’t have widespread use of photonics until around the same time. Don’t expect to buy a superpowered laptop any time soon, folks. However, the very fact that HPE has working hardware represents an important milestone. Now, it’s mostly a matter of refining the experience instead of proving that it’s functional. HP has unveiled the Z2 Mini, a mini PC that packs workstation-class parts, including an Intel Xeon CPU, NVIDIA Quadro mobile M620 graphics and M.2 SSD tech. By using powerful notebook-sized parts, it squeezed that power into a 2.3-inch-high case that’s “90 percent smaller than a traditional business-class tower,” HP wrote. In its top configuration, the device is twice as powerful as any mini PC on the market, letting it run up to six displays in a stock configuration. 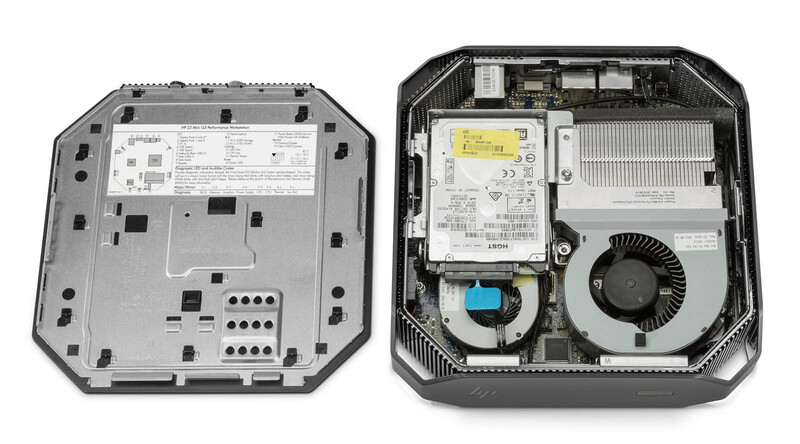 The Z2 Mini is 63 percent quieter than HP’s business-class mini PCs, thanks to a custom cooling system. The PC maker hyperbolically describes the engineering, saying “the octagon form of the Z2 Mini is the most uniquely designed workstation in HP’s 35 years of workstation history.” HP is targeting CAD, design, graphics and 3D users, though it could make a decent gaming rig in some configurations. Spec-wise, it comes with up to 32GB of DDR4 RAM and an HP Z Turbo Drive, with M.2 SSD read speeds over 1GB/s and a capacity up to 1.5TB. You can get one with an Intel Core i7, i5, or i3 CPU, or pay more (presumably a lot more) for Intel’s Xeon E3-1200v5 family, normally used in workstations and servers. Another option is NVIDIA’s mobile M620 Quadro GPU with 2GB of VRAM, also geared toward workstations and officially approved for pro apps like Autocad and 3DS max. However, it doesn’t meet NVIDIA’s “VR Ready” criteria, so it’s not certified with the Oculus Rift or HTC Vive, and would probably allow middling gaming performance, at best. The Z2 Mini is missing a few other features, too. 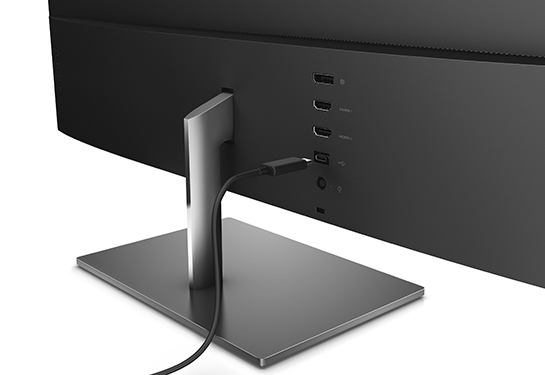 While USB-C is available, it doesn’t have a Thunderbolt 3 port, limiting drive options for video editors. And while it has three DisplayPort slots, it lacks an HDMI port (though USB-C can be adapted for that purpose). As for the price, the compact PC starts at $699, which probably gets you an Intel Core i3 configuration without discreet graphics. Intel hasn’t said how much a stouter setup will cost, but it probably runs over double that with workstation components. If you’re in the market for a small, powerful PC and are tired of waiting for the next Mac Mini, however, it may be your best option. 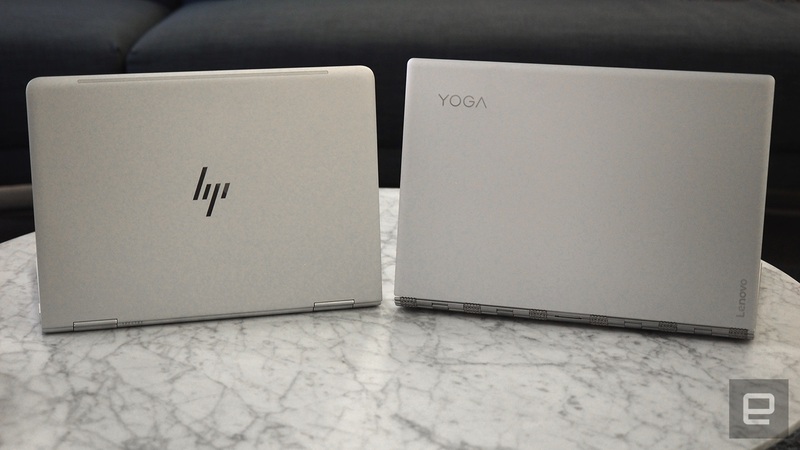 HP said it should arrive to market in December — hopefully we’ll get a better look at it before then. After spending plenty of time with HP’s Elite X3 Windows Phone, it’s hard not to be impressed by the company’s ambition. It’s just too bad the execution isn’t so great. The Elite X3 builds on Microsoft’s Continuum feature, which gives phones pseudo-desktop interfaces on larger monitors, with Workspace, a virtual environment that lets you run full Windows apps. Together with a Desk Dock and Lap Dock, HP intends for the X3 to serve as both a laptop and desktop replacement. But while Workspace is a decent fix for Continuum’s issues, I don’t think it’s enough to make the X3 a viable option for most workers.